If a storm knocks out your power or if for any other reason, your sump pump stops working, there is no defense against the water rising in your basement from the sump pump flooding. As a result, Rapid Recovery Service is available to clean up the mess and restore your basement to its original condition. Available 24 hours a day, seven days a week and will be at your home typically within one hour to evaluate your needs and begin the clean-up process. Let Rapid Recovery Services give you back your peace of mind. One of RRS knowledgeable, friendly representatives is standing by, waiting for your call to handle a Sump Pump Flood Cleanup. After a sump pump failure, we understand how important it is to get your home back to normal. By removing the water, using an anti-microbial application, providing odor and mold control, and many other things, your basement will be clean and dry in no time! 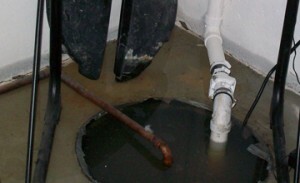 Furthermore, basement flooding from sump pump failure is a common problem in Fraser Michigan, occurring all too often. Also in areas prone to excess groundwater. Results are costly for complicated clean-up projects. Also, potential structural damage to your home, and even health problems from mold growth. The trend in recent decades toward nicely finished basements has raised stakes considerably. Due to basement floods can now destroy expensive entertainment rooms, office equipment, and flooring. Also, Homeowners with active sump pits often feel like they are being held ransom by their sump pumps. People are unable to enjoy vacations or travel without worrying that their sump pump will fail. Because this concern is valid, the causes of sump pump failure make a seemingly endless list. The pump motor could burn out from overuse. A clog could occur. Mud or debris can jam the pump. In addition, the water intake screen can be blocked. Critical components, like the impeller, drive shaft, or float switch can break, disabling the pump. A disconnected or stuck float switch. Clogged waste water discharge pipe, impairing the pump’s ability to remove sump water. Seemingly trivial things can also stop the pump from working. Unplugged by accident or rendered inoperable by a tripped circuit breaker or blown fuse. Power outages are an extremely common cause of sump pump failure. Sump Pumps failures can create unusually extensive water damage. Because power outages tend to occur in conjunction with a storm, there is the threat of the sump pump stopping. While rainwater is actively working to fill your basement with water if the sump pump goes out the threat of damage increases. Finally, If there happens to be a power outage and the sump pump fails to work call us. Rapid Recovery Service can rent generators to avoid issues and threat of water damage. Please feel free to contact us 24/7 if you have a need for a rental of a generator in emergency situations.